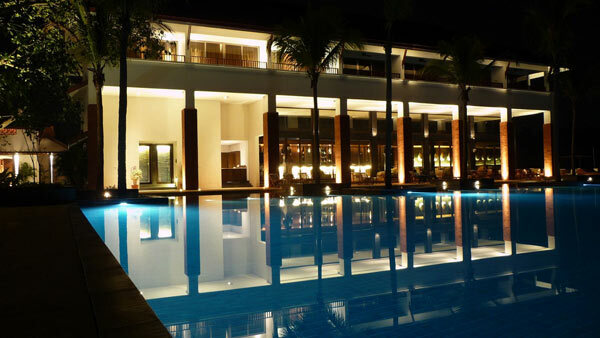 Since opening in December, the Alila Diwa Goa resort has netted the HICSA 2011 Critics Award for Best New Hotel in India, the TripAdvisor Travelers’ Choice Winner 2011 – Top 10 Relaxation/Spa Hotels in India, DestinAsian Luxe List 2010 – 41 Best New Hotels of The Year, and Conde Nast Traveler USA’s Hot List – Best New Hotels in 2010. A mere 20-minute drive from Goa Dabolim International Airport lies Marjorda Beach, where relaxation reigns supreme amid a landscape of lush, verdant rice plantations flowing towards the Arabian Sea. 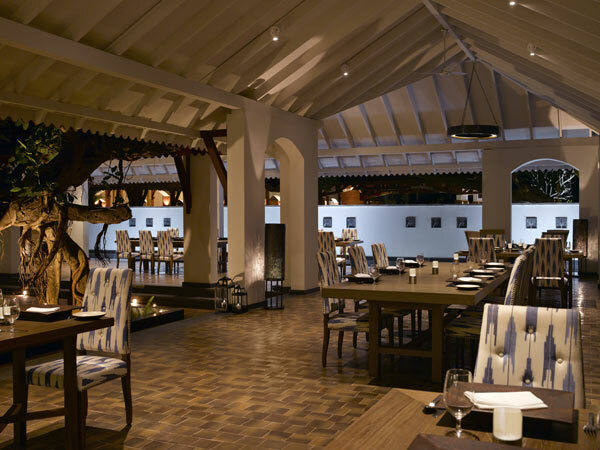 Created as a sanctuary of contemporary elegance, the Alila Diwa Goa resort was inspired by traditional Goan design: steeply pitched roofs, ceiling-high columns, cool verandahs, and tranquil courtyards. Whether enjoying an intimate couple’s retreat or a getaway for the entire family, this resort’s 153 rooms and suites are designed for maximum comfort. The low light levels engender a romantic environment, but there’s also another reason. The entire resort was built in accordance with Green Globe environmental guidelines that are focused on reducing light pollution and respecting the natural habitat of local flora and fauna. In addition, whenever possible, local craftsmen manufactured some of the lighting fixtures using indigenous materials. The client, Seabird Resorts, and the resort operator, Alila Group, entrusted the lighting design and execution to AWA Lighting Designers, which has offices in New York City as well as in Mumbai and New Delhi, India, and in Dubai. The architectural firm, Stapati, has multiple offices in India and is known for using traditional elements in modern context. Heading up AWA Lighting Designers’ team is architect Abhay Wadhwa, who founded the New York-based firm in 2002. Wadhwa is also an adjunct professor for the graduate Lighting Design program at Rensselaer Polytechnic Institute’s Lighting Research Center (LRC) in Troy, N.Y., and is a renowned expert on fiber-optic and LED lighting systems. 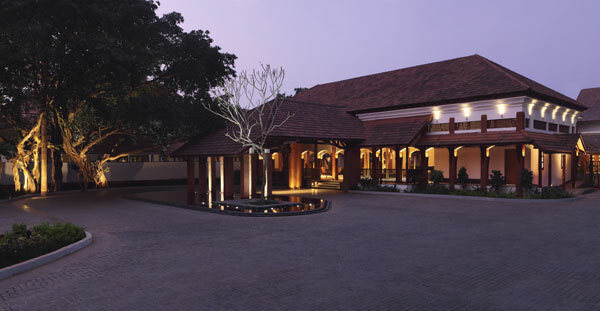 To establish a relaxing vibe right from the start, Wadhwa concentrated on creating an ambiance that would not only extol the uniqueness of the resort’s surroundings, but also the complexity of its architectural features. According to Wadhwa, the lighting plan takes into account changing weather conditions as the foliage thickens and thins with the seasons. For example, the warm, gnarly density of an old bainan tree and the lateral reach of the frangipani tree balance the natural landscape throughout the year. The frangipani tree is uplit by LED lights that provide a frame for the tree, while additional lights are installed underwater in the surrounding pool. Fixtures along the building’s exterior highlight patterns on the façade and generate a welcoming aesthetic as visitors approach. The warm verticals of the archways, plus the illuminated openings, carry guests deeper into the resort. Lighting plays a key role in providing understated elegance to the large entrance lobby. Since the interior of the open-air space flows so naturally from the outside, the illumination coordinates the entire area both inside and out. Recessed uplights set the tone outdoors for visitors who then step seamlessly into the lobby’s interior without experiencing a noticeable interruption in light levels. The lobby’s tall arches are illuminated by cone-shaped fixtures specifically selected to emphasize the direction of the light source without distracting from the simple beauty of the arches they illuminate. Columns receive visual emphasis with downlights that graze the vertical surfaces. In the center hangs a stunning chandelier composed of perforated copper cylinders. This custom fixture design was a collaborative effort between the interior designer and the client and required research and extensive dialogue with the local craftsmen who fabricated it. The gold tiled wall of the reception area glows courtesy of recessed linear lighting fixtures that direct visitors to the front desk. Another recessed fixture tucked under the bar top illuminates the reception table’s distressed gray metal surface that complements the metallic finish of the central copper chandelier. The other public areas are just as aesthetically spectacular as the lobby. Continuing with the open-air theme of the resort, the Spice Studio restaurant is situated on an elevated platform surrounded by stepped pools illuminated by recessed, underwater fixtures. The exotic dining experience – specializing in authentic flavors and cooking techniques of the western coastal cuisine of Karnataka, western Maharashtra, Mangalore, Tamil Nadu, Kerala, and Kutch – is underscored by a subtle, yet complex, lighting scheme. The layers of illumination begin at the dining area and continue out to the periphery, where one’s awareness of the outdoors is heightened by uplit trees in the near distance and an illuminated wall of fountains visible from across the pool. The ceiling is uplit using LED rope light to draw attention to the soaring architecture, while large custom decorative fixtures that were hand-crafted nearby provide additional local flair. 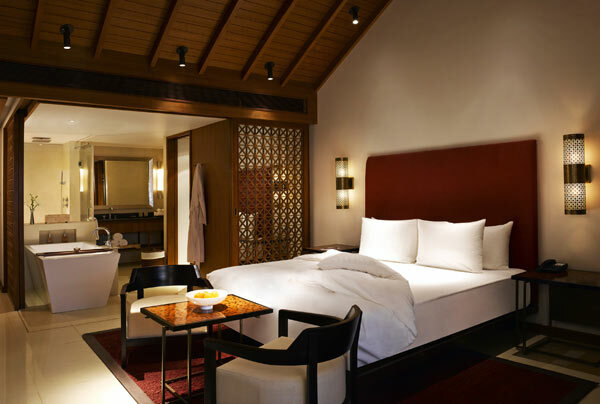 The guest rooms are a blend of modern technology and Goan architecture with a luxurious touch. The resort’s 153 rooms and suites are housed on two levels: the ground-level terrace rooms open to an outdoor space where guests can relax in private; second floor rooms are furnished in a wooden loft style and boast a large private balcony. A newly opened exclusive Diwa Wing allows guests to enjoy both the luxury of increased space plus bespoke services. The lighting in the guest suites was selected to complement the minimal architecture. Wood planks in the ceiling are highlighted by concealed linear LED fixtures that allow light to filter down around the bed. Recessed linear lighting above the desk in tandem with spot task lighting and a decorative pendant create a comfortable working environment. Naturally, as with most hospitality projects, the budget was super-tight. “The design concept that we had developed required fixtures using [indigenous] materials and made by local craftsmen. All of the fixtures had to provide efficient usage of the light they generated,” Wadhwa states. “This required a commitment towards research and time to develop the details. We worked closely with the interior designer and the client in order to successfully accomplish our design goals.” Despite the budget challenge, each space contains at least one custom-made lighting fixture.